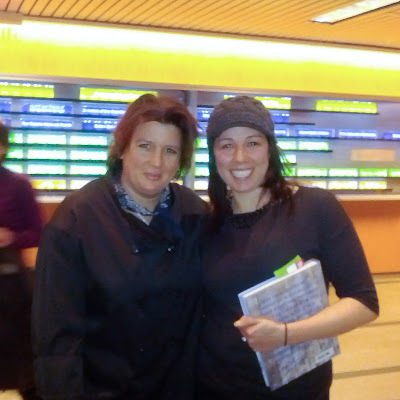 The other bonus of going to she her speak is you get her cookbook - Pitchin In (signed and personalized). The cookbook is full of over 100 fantastic recipes. She has one or two recipes focusing on key ingredients, similar to how the show is set up. There is a lot of seafood and shellfish (which I don't eat) but the rest of the book makes up for it, Especially the desserts - WOW! I literally can't wait to bake them all, especially the bacon caramel sauce. The first recipe I decided to try was her Red Velvet Cupcakes but with a Sweet Twist spin, of course. We had a dinner to go to last weekend and I offered to bring dessert, thinking cupcakes are always a good choice. Is it me or has Red Velvet desserts exploded lately? Maybe it is just Valentines day but they are everywhere and spun in every fashion. Cookies, crepes, ice cream, brownies, there are a lot of pretty cool ideas out there. 2012 is the year of Red Velvet. Who can blame us, Red Velvet desserts are tangy and sweet with nice sublte chocolate undertones. Here is my easy spin. 1) Preheat oven to 350F. Line a muffin tin with 9 liners ( recipe called for 12, but I guess I made them bigger). 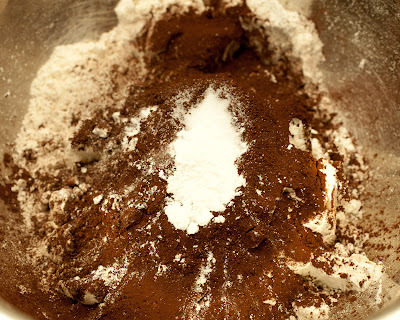 2) In a medium bowl combine flour, cocoa powder, baking powder, baking soda, salt. 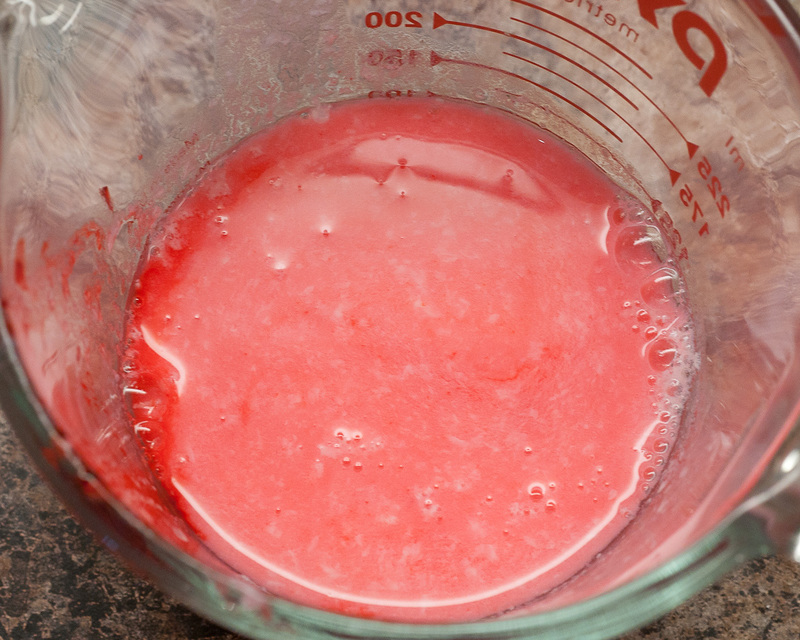 3) In a measuring cup combine buttermilk, vinegar, vanilla and food paste and whisk together. 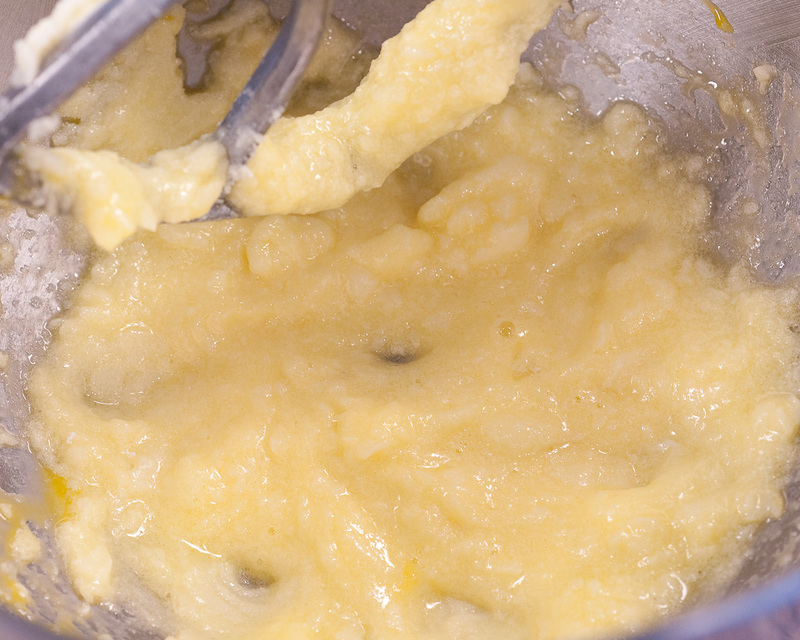 4) In a large bowl or with your mixer, beat together butter and sugar until creamed. Add egg and beat to combine. 6) Fill muffin cups 2/3 full. 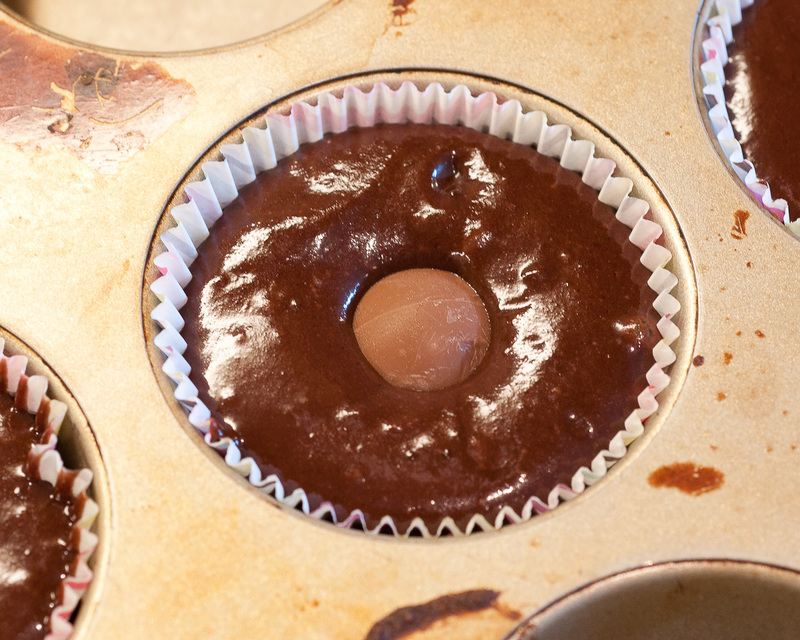 Add one Lindt ball to the center of each cupcake, pressing down, then use a spatula or spoon to just cover the Lindt ball with the mixture. 8) Make the icing - In a large bowl or mixer bowl beat together butter and cream cheese until creamy and smooth. Add icing sugar and vanilla starting on low, gently moving to high as icing sugar is incorporated. Add cooled melted white chocolate and beat to combine. Red velvet white chocolate is a great combination. 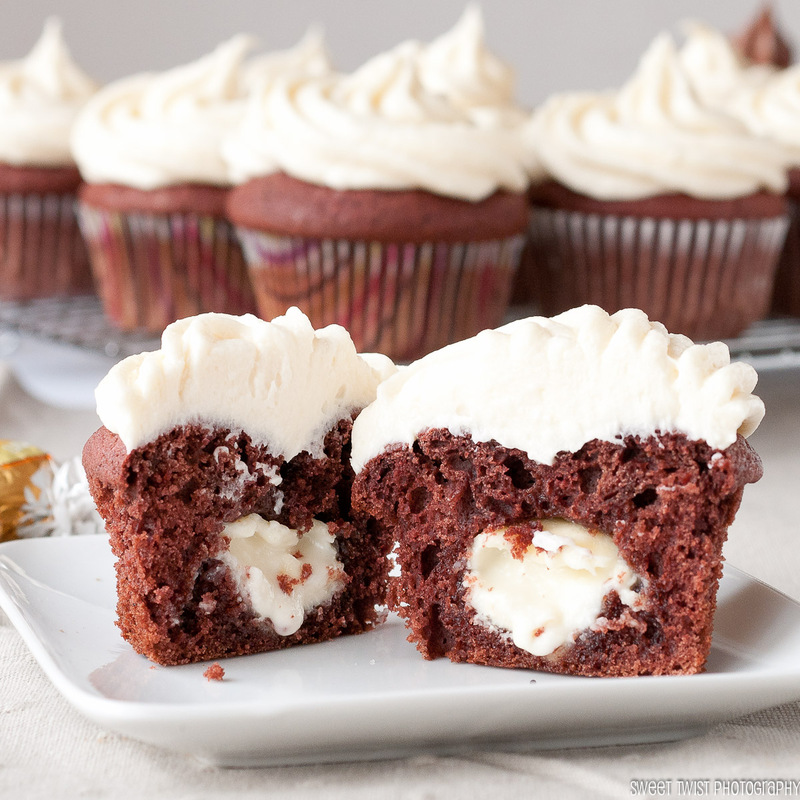 I am not sure what it is but cupcakes with a creamy chocolate center are oh soooo good. Lucky for my readers when I was at the event I picked up an extra signed Pitchin' In cookbook from Lynn. Leave me a comment with one of your favorite ingredients to cook or bake with. Giveaway open to residents of Canada and the U.S. Contest open until noon on Feb 18th. These cupcakes were the shizz. Im so glad I was able to be there and snag one for myself! Nom nom. I love cooking with chocolate or cream cheese! I love the idea of using a Lindt ball in the middle of the cupcakes! It's hard to choose a favourite ingredient, but since it's Valentine's Day, I'll choose the lovely red beet - Beets are so versatile and I love finding new ways to use them! I love baking with pumpkin. Amazing idea with the Lindt ball! I love baking with cranberries, bananas, and pumpkin. I love baking with sour cream and buttermilk! I love love love baking with chocolate chips! 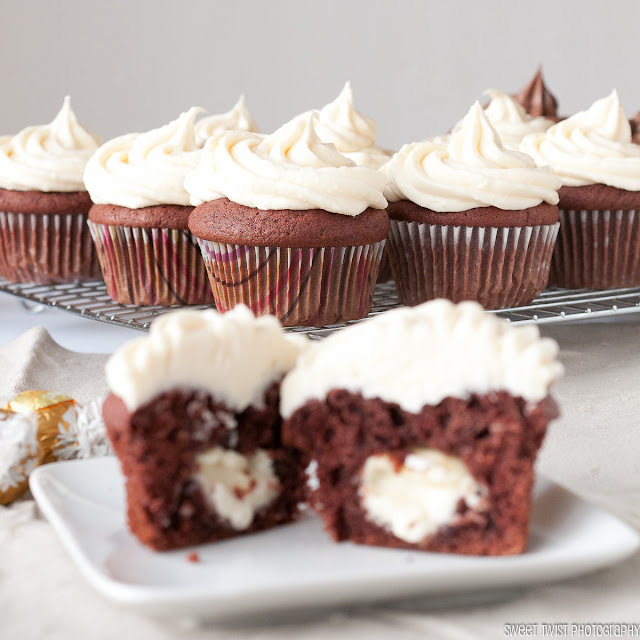 :) I also love red velvet cupcakes...gotta try this recipe! Here I am and here I go.. I followed your page on Facebook (I didnt know you had one, I would follow anyway..) , I am following you on twitter, I just tweet that I want the book! !, I am following the blog (duh! ), and I just pinned the amazing red velvet white chocolate cupcakes!!! I love Lynn Crawford and you look so sweet!! The step by step phtographs are excellent! 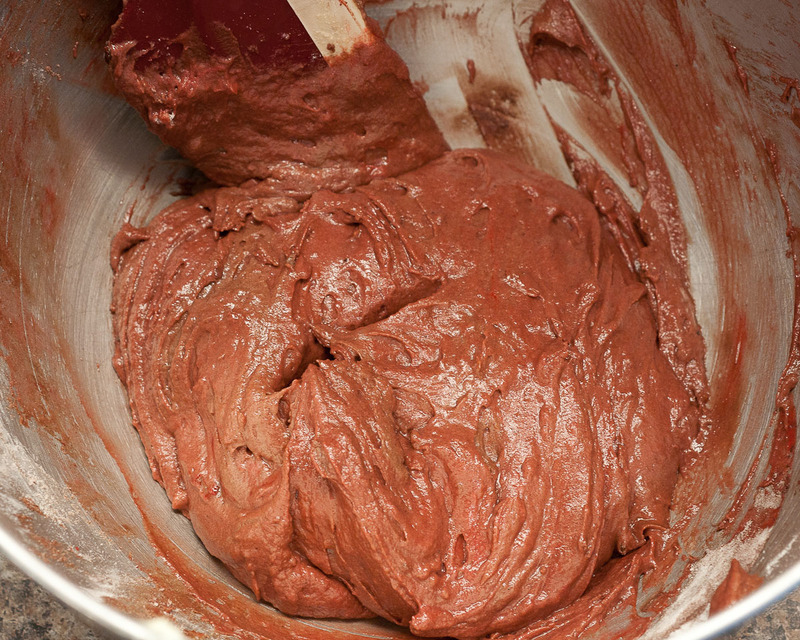 My favorite ingredient to bake with is one Chef Lynne used on the show! Avocados! Great in vegan cakes and for avo buttercream icing! Love these. Love love love. They are just so utterly darling. And delicious. Loving all the awesome ingredients everyone likes to use. Lately my favorite ingredient is Nutella, it just adds that extra nutty cocoa goodness to recipes! I will have to make some time to try this, it looks awesome! I like using pudding in my cookies or cakes sometimes. Freeze the lindt balls before hand. If you don't it ends up as a melted mess on the bottom of the cupcake. Yes, freezing is key. The ingredients say it should be frozen.